I am Aina and also known as haruna_hamasaki in STAGE48. 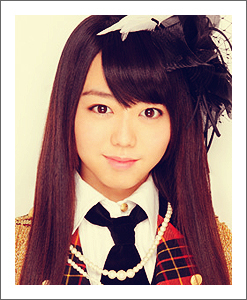 I am an AKB48 fan since the debut of Sakura no hanabiratachi in December 8th, 2005. It's like falling in love at first sight. Dear Mr. Akimoto Yasushi, if you read this, I want you to know that this lyrics site is created because you have produced great groups whom had inspired me to make this lyrics site as the only reliable lyrics source for international fans. I really wish to meet AKB48 one day but I am not that "okanemochi". Please give me free flight tickets so that I can meet them and I can tell them that I'm the creator of STUDIO48. ^^"
©2007 AKB48 Lyrics Paradise. ©2009 STUDIO48. All Rights Reserved. Original Design by FCT & Edited by haruna_hamasaki.